Is it April Fool’s Day? Has somebody in Paris hacked the website at the Organization for Economic Cooperation and Development? Have we been transported to a parallel dimension where up is down and black is white? Not even Keynesians, after all, think higher taxes are a recipe for growth. Ah, never mind. I just remembered that the OECD is a hotbed of statism, so the press release makes perfect sense. After all, the US-taxpayer-funded organization has become infamous for reflexively advocating big government. The OECD endorsed Obamacare, as I explain in this video. With this dismal track record, it’s hardly a surprise that the Paris-based bureaucracy is now pushing to undermine prosperity in Latin America. Here’s some of what the OECD said in its release. Additional tax revenues enable governments to simultaneously improve their competitiveness and promote social cohesion through increased spending on education, infrastructure and innovation. Latin American countries have made great strides over the past two decades in raising tax revenues. You won’t be surprised when I tell you that the Paris-based bureaucrats do not bother to provide even the tiniest shred of proof to support the silly claim that higher taxes improve competitiveness. But that shouldn’t be surprising since even Keynesians don’t believe something that absurd. And the claim about social cohesion also is a bit of a stretch given the riots, chaos, and social disarray in many European nations. Let’s see what else the OECD had to say. Wow. The OECD is implying that Latin American nations should mimic OECD nations. In other words, the bureaucrats in Paris apparently think it makes sense to tell nations to copy the failed high-tax, welfare-state model of countries such as Greece, Italy, and Spain. Is that really the lesson they think people should learn from recent fiscal history? Are they really so oblivious and/or blinded by ideology that they issued the release as these European nations are in the middle of a fiscal crisis? To further demonstrate their bias, the folks at the OECD even acknowledged that the Latin American nations, with their less oppressive tax regimes, are enjoying “relatively strong economic conditions.” Normal people would therefore conclude that the failed high-tax European nation should copy Latin America on fiscal policy, not the other way around. But not the geniuses at the OECD. Now that we’ve addressed the awful policy advice of the OECD, let’s take a moment to look at the real policy challenges facing Latin America. The Fraser Institute, in cooperation with dozens of other research organizations around the world, produces every year a comprehensive survey measuring Economic Freedom of the World. The report ranks 141 nations based on dozens of variables that are used to construct scores for five key measures of economic freedom. Of those five categories, the Latin nations have the highest average ranking on…you guessed it…fiscal policy. Yet the OECD wants policies that will undermine the competitiveness of the Latin nations, hurting them in the area where they are doing a halfway decent job. If the bureaucrats actually wanted to boost economic performance in Latin America, they would be pressuring those nations to make reforms in the two areas where the burden of government is most severe – legal structure/property rights and regulation. But that would make sense, which is contrary to the OECD’s mission of promoting statism. The only semi-positive thing to say about the OECD is that it is consistent. As this video explains, the Paris-based bureaucrats are advocating bigger government in the United States. And to add insult to injury, they’re using American tax dollars to push that agenda. What a scam. Politicians from various nations send taxpayer money to Paris. 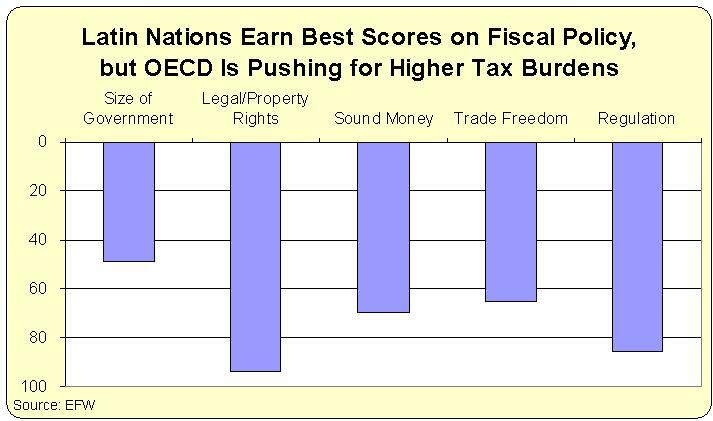 The bureaucrats at the OECD then issue reports and studies saying the politicians in those countries should raise taxes and increase the burden of government. Everybody wins…except for taxpayers and the global economy. Per dollar spent, OECD subsidies may be the most destructively wasteful part of the federal budget. And that says a lot. Is the Economist a liberal enough source for you? The answer isn’t to raise taxes on the rich. We need to close tax loopholes and lower taxes for the rest of us. Poor Latin America…falling prey to elitist moochers. The percentage of time that an individual will be forced to work to benefit distant others is a communal decision. Those who disagree with the above statement shall not be allowed to exist — not only in this country, but anywhere in the world. You will not be able to escape, even if you move to Gingritch’s moon colony. As the benefits of flaunting these attempts to globalizing the oppression of mandatory collectivism rise, some countries will refuse to join or break free. Ironically it may be oppressive regimes that first do so, rather than western nations — and that, unfortunately does not bode well for democracy. What to do when you have 10% owning 80% of Wealth and getting 50% of Individual income? Cut their taxes?